Today I brought you a fun stencilled card as #6 in my Under the sea Card Series. I just love the Tropical fish stencil from Newton’s Nook Designs and wanted to try a fun technique with it. I placed it on white cardstock and mixed some Distress inks with Ranger Transparent Glossy texture paste. I used a spatula to apply it over the stencil making sure that the colours mix with each other. I removed the stencils and washed it immediately under running warm water. Until my background was drying I die cut a stitched rectangle and the Celebrate word die (Sugar Pea Designs) 3 times from Blue Violet cardstock. I stacked them together for more dimension using Ranger Multi Matte Medium with a precision tip. I also stamped another sentiment from the Sunny Studio Oceans of Joy stamp set on a thin white strip using Blue Violet ink. I gave this an aqua mat to help stand out from the background. I assembled the card on a white card base and popped up the sentiment strip with 3D foam squares. I love the shiny finish of those gorgeous fish! Such a unique stencil! 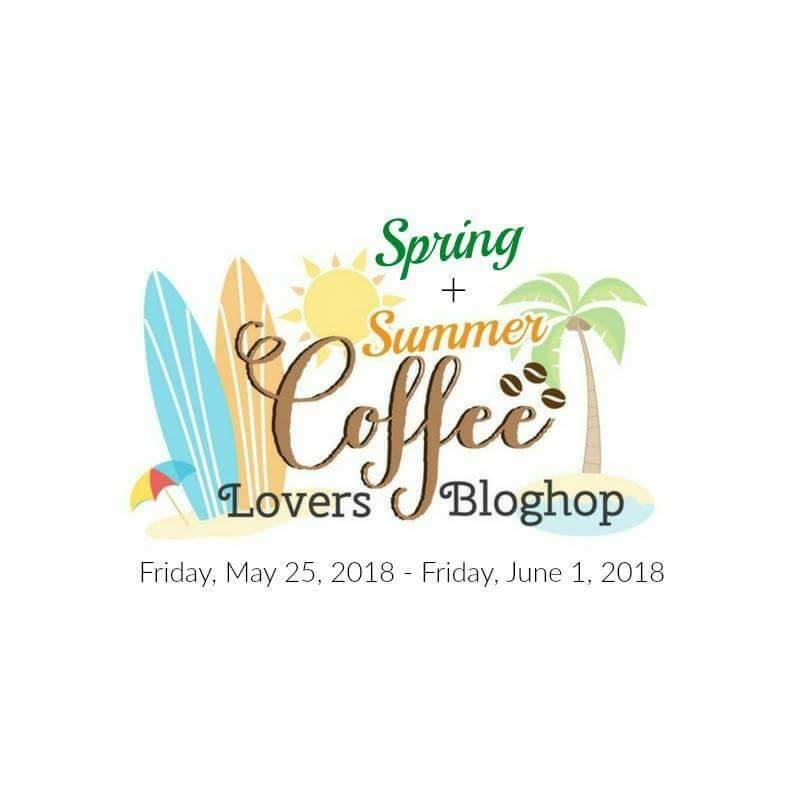 A quick second post today as I am participating in the Coffee Lovers Blog Hop Spring/Summer and the Create a Smile Thank you Challenge. I had a very simple and clean card design in mind, therefore I clear heat embossed the cup from the CAS Coffee First stamp set on a strip of aqua cardstock. I also heat embossed with the same clear embossing powder a sentiment from Honey Bee Stamps, in the middle I die cut the Latte word with its shadow from coloured cardstock. I layered 3 die cuts on top of each other for more dimension. I coloured the image with Prismacolor pencils and added glossy accent to the heart on the mug. I gave this strip a brown thin mat, adhered it to a patterned paper, which also have a brown mat. Then I mounted it all on a kraft card base. To finish off the design I stamped 3 hearts above the mug from the CAs stamp set using brown ink. I hope you like this simple card design, perfect for guys too. I have some more coffee cards for the hop ready, so make sure to check back soon. 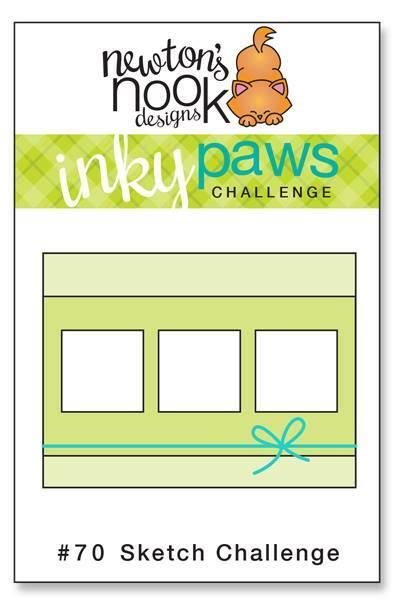 I am back with some fresh inspiration for the Inky Paws Challenge #70. I felt the sketch was shouting for a masculine card, so I gave it a try and came up with this design. I started with selecting patterned paper and matching cardstock. I cut a window die from the olive cardstock and backed it with a strip of vellum. Before adhering it with foam tape, I heat embossed a sentiment from the Deer friend stamp set using gold embossing powder. I really wanted to use the Splendid stags dies to cut some gold glitter deer. But the die I liked faced right. I needed a mirror die cut, so I simply cut it from the back side of the glitter paper. Worked out great, the scratches of my well used cutting plates do not show due to the glitter. I popped up the 2 deer partially with foam tape and my clean and simple card for him is done. I wish you like it and got inspired to play along the sketch challenge at IPC. 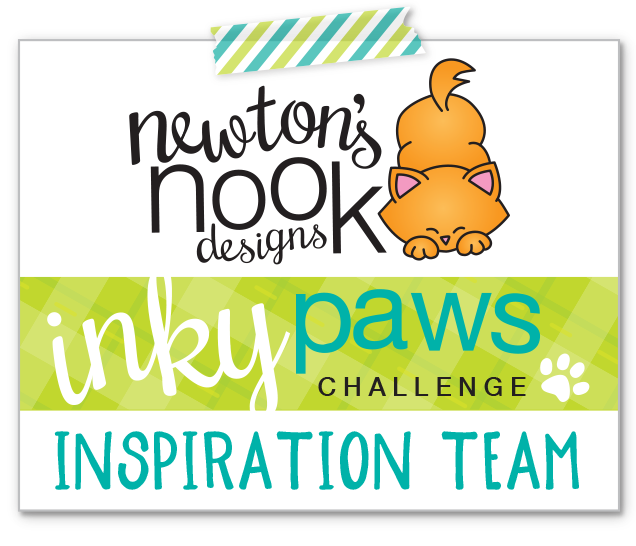 There is still 5 days left for you to enter the challenge and be eligible to win the 20 USD gift certificate to the Newton’s Nook online store. I will link this project up to the Simon Says Stamp Wednesday Challenge Sparkle and Shine. 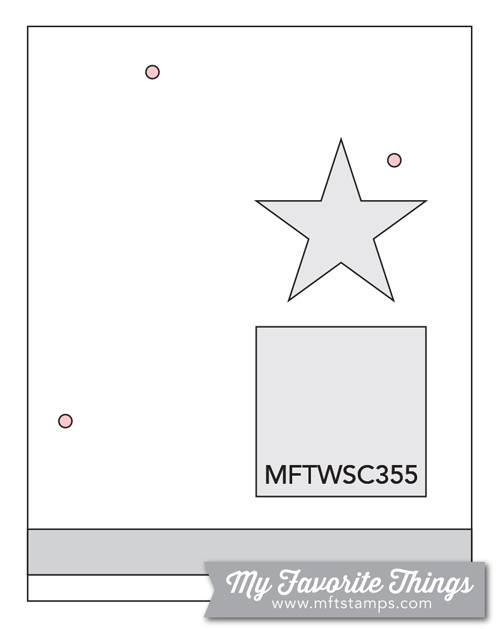 I am popping in today with a quick post for the almost finishing MFT sketch Challenge #367. It is my second card in my Love Themed Card series this year. My friend, Amy Yang inspired me to re-visit paper piecing. I recently ran into a nice paper pack at our local discount store (Aldi) and the simple red-white dots one caught my eye. I cut a 1,5 inch strip of it to cover part of a white card base. I die cut 2 stitched rectangles: a red and a white one. On the latter I stamped the cute girl from a retired MFT Pure Innocence set and coloured with Copics. Then I stamped the image on the patterned paper again and cut the dress out with scissors. I ran a black marker on the edges before adhering it to the coloured one. I stamped the sentiment from the same set in Versamark ink and white heat embossed on a black strip of cardstock. I made it to a banner and popped up on the card front with 3D foam tape. A bit of stickled on the shoes and heart and a tiny amount of glossy accent on the hair charm finished it off. I will upload this project to the MFT Sketch Challenge #367 and the Simon Says Stamp Wednesday Challenge Patterned paper. I hope you like my card and will return son for more love themed fun. I am back with a quick share as it is really running late here. I still have plenty of stickers from the Doodlebug Booville sticker collection and they are simply too cute not to be used. So I decided to make mini scenes on tags with them. 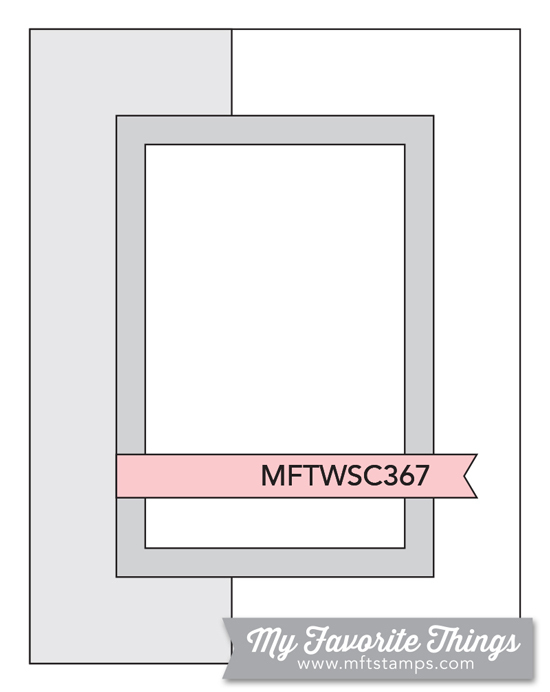 I started with die cutting several tags (MFT Blueprints) from white cardstock and the tag fronts from black cardstock. I sponged some distress ink on the white ones, sprayed them with water and dabbed it off with a paper towel. I die cut little banners from white cardstock and stamped a sentiment in black on them. I assembled the tags, popped up the sentiment banner with 3D foam tape and added the cute stickers to make the scenes. I added some black and white ribbon and tied a silver bow on them. I prepared the card bases from heavy weight white cardstock and added strips of patterned paper on their left side. I also added a thin strip of glitter paper next to it and covered up the joining lines with a colourful stitched strip (Lawn Fawn Picket Fence die). I adhered the tags using 3D foam tape and I had 3 cards done in short time. I hope you got inspired and will pop in again tomorrow for more fun. I have recently bought the Doodlebug Booville stickers along with the paper pad, which is great as the designs work perfectly together. All I had to do is to choose a patterned paper with cute spiders on it, cut it to fit the front of an A2 sized card. I die cut a stitched rectangle from dark grey cardstock and also a spider web in the middle of it (Memory box die). I backed it with a white piece of cardstock. I adhered 2 little spider stickers to the web and the colourful Halloween sentiment sticker under it. All I had to do is to heat emboss Happy above it in white. I popped up the panel with foam tape to have some dimension and my cute Halloween card was all done. Perfect for people who are not afraid of spiders (I am totally scared of them but this card would still make me smile). I hope you will check now all your stickers and make some quick and easy cards with them. I will upload this card to the Simon Says Stamp Wednesday Challenge Anything goes. If you like this post, please subscribe and come back tomorrow for more Halloween fun. Sometimes we need quick and easy cards for the men in our lives and there is no time to stamp and colour. Die cutting is an easy way to get a simple card done in short time. The card I am sharing today was inspired by the Merry Making Online card classes and the almost closing MFT Sketch Challenge #355. I started with die cutting a stitched rectangle from kraft cardstock and splattered it with water. I added white embossing powder and heated it with my heat gun. I saw this technique from Jennifer McGuire and I wanted to try as it seemed easy and perfect for snow. I had to heat it longer than usual to allow the water drop to dry first before the powder melted. When the background was finished I used 2 arrow dies from the Blueprint 7 die set to cut little green scrap pieces. I glued them on a piece of typing paper and I used my paper trimmer to cut a triangle shape. I made a little trunk from brown cardstock and die cut a star from Blueprints 8 to go on the top of my tree. I added some Spectrum Noir shimmer to some parts of the tree and the star, and I also coated this one with glossy accents. I adhered my handmade Christmas tree on the background, die cut a sentiment from dark green cardstock and stamped the word Happy above it with brown ink (from the MFT Essential sentiments set). It is a very clean and simple, rather masculine card for the holidays. I will upload this to the MFT Sketch Challenge #355 and to the MFT Creative Construction with Blueprints Challenge (Right this way) too. Hope you got inspired and will return soon for the last minute Halloween cards I promised.